Map of Russell Fork area centered at the Breaks. Getting to the Russell Fork can be almost as challenging as running it. Be aware that very large trucks travel these narrow and winding roads. That fancy new Explorer can be just another grease stain on the road if it crosses a tandem coal hauler. Take it easy. Elkhorn City is located on Route 80, 23 miles southeast of Pikeville. Haysi is 17 miles beyond Elkhorn City, also on Route 80. Both towns are accessible from U.S. 460 to the north and U.S. 23 to the south. The Pool Hole River access is located on Rte 80, approximately 2 miles east of Elkhorn City (if you hit the Virginia state line, you've gone way too far). The Garden Hole River Access is located on Rte 80, approximately 9 miles east of Elkhorn City and a half mile past the main Breaks Interstate Park entrance, or 8 miles west of Haysi. The road into Garden Hole is a mile of gravel and dirt and requires a four wheel drive in inclement weather (that means snow or rain). The Bartlick River Access is located on HWY 611, approximately 4 miles off Rte 80 (and about 5 miles beyond the Park entrance or 4 miles from Haysi). To get to Flanagan Dam River Access, follows the signs from Bartlick (or from Haysi). The most common route into the Breaks canyon is via the railroad tracks. While much easier than the brutal river trail hike from the main Park, the railroad route offers a high trestle and long tunnels. O yes, and coal trains. You can start on the Elkhorn City end at Pool Point (steep curve just downstream from Ratliff Hole). Follow the path over the hill to the tracks and cross the trestle (quickly). 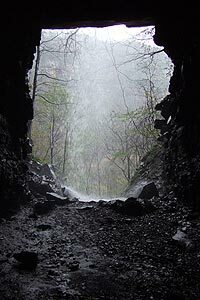 Hike upstream approximately one mile to the state line tunnel (bring a flashlight). hike through the tunnel and another half mile to El Horrendo. From the Garden Hole end, paddle your favorite water craft across the river and hike the tracks downstream. Pass through the tower tunnel (much shorter than the state-line tunnel, but don't forget that flashlight). Just out of the tunnel and over the hill is the trail to Fist. About 150 yards down the tracks is the path down to triple drop. Another two hundred yards to El Horrendo.